Hexpad™ Girdle with High Hip Pads. A pro compression girdle with HexPads™ protecting the hips and tail bone. It features additional pads that extend above the waistband to protect the top of the hip. Our Ultra hDc™ Moisture Management Technology enhances heat control, comfort and performance. 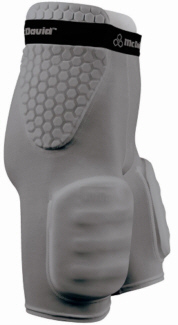 Pockets for thigh pads (pads not included). Sewn-in cup pocket. Compression fabric acts as a second skin to support large muscle groups to reduce pulls and fatigue. Provides relief from chafing and skin irritation.